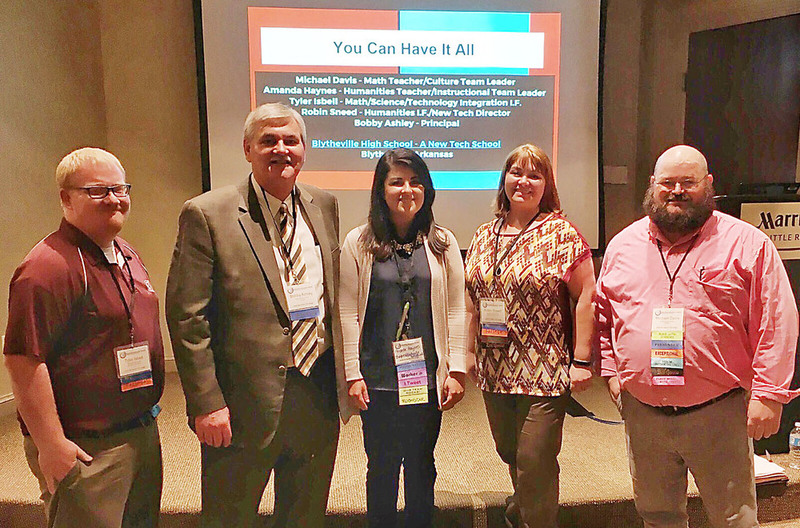 Blytheville High School principal Bobby Ashley (second from left) and the teachers who presented at the Sept. 26-27 Educational Innovation Summit in Little Rock include (from left) Tyler Isbell, Amanda Haynes, New Tech director Robin Sneed and Michael Davis. Administrators and teachers from the Blytheville School District presented a special session last summer at the national New Tech Annual Conference in St. Louis, and it was so well received by the attendees that they were asked by New Tech officials to give a similar presentation again last month in Little Rock at the Education Innovation Summit. "We are proud that BHS teacher leaders and administrators are being recognized for their innovative approach to learning,” stated Sally Cooke, director of Curriculum in the BSD. “They have been contacted by schools in other states who want to visit and view their model, which speaks highly of the level of implementation at the school, and being invited to present at the Innovation Summit was a great opportunity to showcase what they are doing well and also to learn from others in attendance." Blytheville High School principal Bobby Ashley, New Tech director Robin Sneed, instructional facilitator Tyler Isbell and teacher leaders Michael Davis and Amanda Haynes presented in a 45-minute session “You Can Have it All: The Importance of Teacher Leadership and Adult Learning in Sustaining Innovation” at the Sept. 26-27 EIS at the Statehouse Marriott. The summit is organized every year by the Office for Innovation for Education and the Arkansas Department of Education. It is designed to promote innovative thinking in public schools; its purpose is to redesign and transform the way traditional schools look and operate. BHS New Tech was asked to present at the New Tech conference because it has been recognized by New Tech Network officials as a model school for showcasing teacher leadership. Last spring BHS New Tech hosted a New Tech Network “Site Institute”, “Take Me to Your Leader”. The conference was so well received, Sneed stated that Anna Kinsella, BHS’ New Tech School Development coach, asked that the school do another version of the institute at the New Tech Annual Conference. Fourteen educators from BHS, including members of the leadership team and teacher leaders, attended the conference. Davis, after collaborating with peers, submitted three proposals, all of which were accepted. In St. Louis a host of Blytheville administrators and New Tech teachers listened as Davis talked to other educators about “Math: The Struggle is Real”. Isbell, BHS’ Math, Science and Technology instructional facilitator, joined Davis from a remote location. “Mastering the Master Schedule”, presented by Davis, Sneed and teacher leader Joy Wicker, was another session that was requested by participants of the Site Institute. The third session, also entitled “Take Me to Your Leader”, was presented by Davis and Haynes. After the presentation a New Tech participant from Buchtel Community Learning Center in Akron, Ohio, asked Haynes about partnering with her to provide additional encouragement and support for teacher leadership. According to Sneed, Haynes has been e-mailing that participant since the beginning of the school year. Following the New Tech Conference, Alan Veach, director of District and School Development, requested that BHS represent New Tech at the Education Innovation Summit in Little Rock. Kristen Cuilla, New Tech’s senior director of Partnerships and Communication, submitted a proposal to the Office of Educational Innovation based on the work BHS has done around promoting and supporting teacher leadership. The proposal was accepted. In “You Can Have it All”, Davis, a cultural team leader, and Haynes, an instructional team leader, explored the role of teacher leaders in sustaining innovation. Both discussed how they assessed their approach to teacher leadership, and then helped build a system that nurtures and engages teacher leaders and supports adult learning. In addition to presenting at the summit, the BHS team members were able to learn about educational innovations happening across the state. The summit began with keynote addresses by John Spencer, a former middle school teacher and current college professor and co-author of “Launch: Using Design Thinking to Boost Creativity and Bring Out the Maker in Every Student”; and Dr. Darryl Adams, recently retired superintendent who was recognized by President Obama as a top 100 Innovative Superintendent in the nation. Arkansas Commissioner of Education Johnny Key presented prior to Spencer’s keynote. The team members attended a variety of breakout sessions over the course of the conference and have plans to research some of the innovative educational initiatives presented, including flex mod scheduling, personalized learning and leveraging digital tools.